The Loyalty card was thought to benefit our most regular guests (on accommodation basis). With our card the amounts spent in accommodation in our Hotels located in Portugal are turned into POINTS (Eurosol Hotels Points also named Points or PEH’s) which can be redeemed in discounts in accommodation later on and/or other services pointed out in this regulation document or one can even exchange this points by free accommodation or services. The fact of being a preferential client allows you to benefit from special conditions. You can make the payment of your stay, meal and/or some other services through this loyalty program deducting points from previous expenses you have made at our hotels and have turned into Eurosol Hotels Points. You should inform the reception at check-out that you wish to pay the stay with your loyalty card after which we will issue a voucher that we will deduct from your bill or amount you have spent while staying with us. To obtain this card you should address the reception staff while checking-out and then you will be handed a card immediately. 24 hours later the points related to your stay will be credit onto your account. The card should be presented each time you use our services. The card is property of “E.H. Hotéis e Turismo, SGPS. SA”. This card is aimed at individuals and is not transferable. Only the holder of the card can benefit from the special conditions even if it is a company paying for the services. I.E. professionals travelling. Points are only credit to someone’s account after payment is made. Travel Agencies, Booking Agencies and other intermediaries are not allowed into this program. Clients who book our hotels through these agencies cannot use their points to pay or get a discount. However any other services purchased directly in our hotels can be paid through points as well any expense will be credit into the clients account should they present their card. Purchases relating to Meeting Rooms, Banqueting and Groups bookings are not accountable in the points system. Is not possible to accumulate or use points in group bookings/reservations. It is not possible to use, accumulate Points or beneficit of additional discounts in programs or specials should these exclude the Loyalty card. The Eurosol Hotels Points are given accordingly to the expenses made and related to the hotel room – accommodation, bar and restaurant . For each euro of expenses, as long as referred as such in the regulation of this program, the client will have 1 Point credit onto his account/card. The Eurosol Hotels Points can also be earned through eligible debits up to a maximum of 3 hotel rooms booked. In this case these rooms should be booked under the card holder’s name as this one should be the one paying the bill at check-in. - The possibility of exchanging Point (PEH's) for any expenses. This exchange can only be done at the reception of the hotels mentioned in this regulation document which are named above. - Products and services with preferential conditions in associate / registered partner entities: Clínicas Persona, Já Passei, Science4You. New partnerships will be announced shortly. Forme more information about the benefits of Eurosol Hotels Guest Card, please ask the Reception of the Hotel. 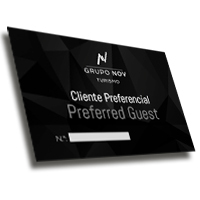 To earn the benefits of the Preferred Guest Eurosol Hotels one should present it at the check-in or saying the card number while booking the hotel room. While checking-out the card holder should again produce the card at the reception desk and request the registration of the Points related to his or her stay. Each time the client wishes to exchange the Points for accommodation should always mention it either at the moment is booking the hotel room or at the moment of check-in. In this situations it is always used the existing balance on the card at check-in or reservation moment. 50 Points EH correspond to 1,50€ to be used. Can be used at least 50 points. The payment of the accommodation and booked services should be done at check-in and the payment of other extra services should be done at check-out, unless otherwise informed. Should one use have a credit payment the Points will only be credit after payment is confirmed. Points have one year validity after being credited onto the card holder’s account. The above mentioned conditions can be changed without previous warning and when informed to the card holder it should be done at the websites already informed. The membership and the use of this card assume the full agreement on the rules contained in this Regulation as well as the consent of the card holder in the personal data treatment disclosed when filling the membership form. To the card holder is guaranteed full confidentiality of the entrusted personal information. The personal information contained in the membership form – profession, date of birth, email address, is voluntary so should the card holder not wish to disclose the information can still enroll the loyalty program. The personal data collected should used exclusively for the management of the card account – benefits, Points balance and registration.